U.S. response to Sony hack: What can government do? U.S. Will Reportedly “Respond” to Sony Hack, but How? 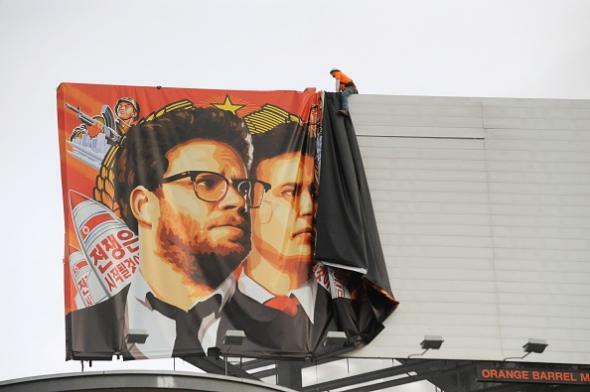 A billboard ad for The Interview is taken down in Los Angeles. The toughest option: The United States could restrict North Korea’s dollar-denominated trade by hitting Chinese banks that do business with Pyongyang – a tactic used against Iran and, less comprehensively, against Russia after its incursion into Ukraine’s Crimea region. A CNBC piece elaborates on that option, suggesting specific companies working inside the country could be sanctioned. Firms working with North Korea include Egyptian telecom Orascom, which reportedly just earned $500 million from its work to provide cellular service to more 2 million North Koreans. Even Chinese companies operating in the country could be targeted, experts said, although sanctions against these firms could result in consequences that spill beyond the Korean peninsula. In general, CNBC writes, China’s influence on North Korea could make it something of a fulcrum for the United States response; North Korea might not care what the United States thinks of it, but it cares about China, and China in turn cares about its relationship with the U.S. Ultimately, the best strategy for retaliation against Pyongyang may be to lean on China, said Bruce Bennett, a senior defense analyst at Rand Corp. If the U.S. can establish sufficient evidence that Beijing either trains or provides resources to North Korean hackers, the government would do well to threaten China with accessory charges to the Sony hacking, he said. Additionally, government representatives could emphasize that North Korea is upsetting China’s goal of regional stability. Beijing would likely be able to sway Pyongyang’s hacking policies, as Chinese firms account for much of North Korea’s foreign investment. As of yet, the United States hasn’t even officially identified North Korea as the entity responsible for the hack—though CNN reports that could happen as early as today.